Malta, surrounded by the most sparkling and clear of seas, is a natural haven for the yacht charter business. You'll have no difficulty finding a boat charter company in the Maltese Islands, yet, one truly stands out when it comes to skippered charter service. Azure Ultra's team of charter specialists excels in creating unique Mediterranean yachting holidays with a superior level of quality and service excellence. 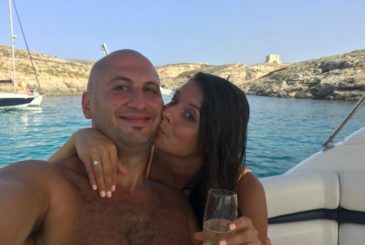 While it may sound bold to state that it is the best yacht charter company in Malta, here's what makes Azure Ultra truly stand out a notch above the rest. You don't have to take our word for it that Azure Ultra excels in its field. 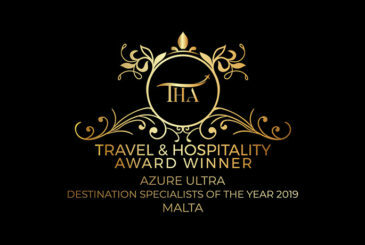 The Malta-based British company has received several awards by various authorities commending different areas of Azure Ultra's service excellence. Azure Ultra's outstanding service to its customers is widely recognised. The authoritative travel review site TripAdvisor awarded Azure Ultra the Certificate of Excellence 2017 due to consistent high ratings. Locally, Azure Ultra was also the winner of Best Customer Service of the Year 2017. 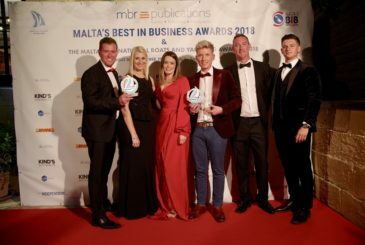 Other awards include Best Maltese-based Charter Company of the Year 2017 at the Malta International Boats and Yachting Awards 2017 and Unique Tour Company of the Year 2018 at the Travel and Hospitality Awards (Malta) 2018. 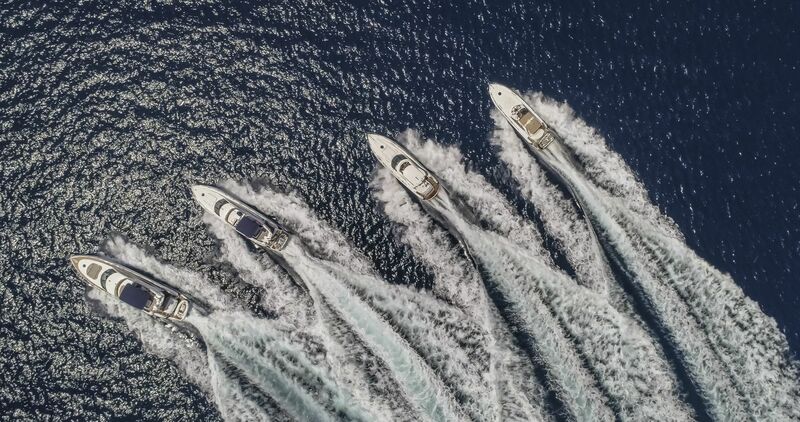 Azure Ultra was also awarded the title of Europe's Leading Fractional Motor Yacht Ownership Programme and named 'top player in the field' by Piers Brown, CEO of International Hospitality Media. Let's have a closer look at what makes Azure Ultra an award-winner. Inviting you to go beyond ordinary and make your yachting experience truly memorable, Azure Ultra’s private yacht charter is fully customisable. Charter a yacht for a special occasion, enjoy a half-day or day trip, indulge in a full-blown yachting holiday in Malta or venture to explore the middle region of the Mediterranean. Discuss your route and destination with your captain, who will offer suggestions based on his experience. Make your dietary requirements and preferences. Include a variety of extra services. Azure Ultra's team of luxury yacht charter specialists will expertly customise your on-board experience. They will match your specific requirements and budget, whether for special occasions or simply to sample the boating high life. In a few words, when chartering a yacht with Azure Ultra, yachting takes on an all-new dimension of personalisation. Your private yacht charter is based on your individual preferences, from where to go and what you do there, down to what you eat and drink. 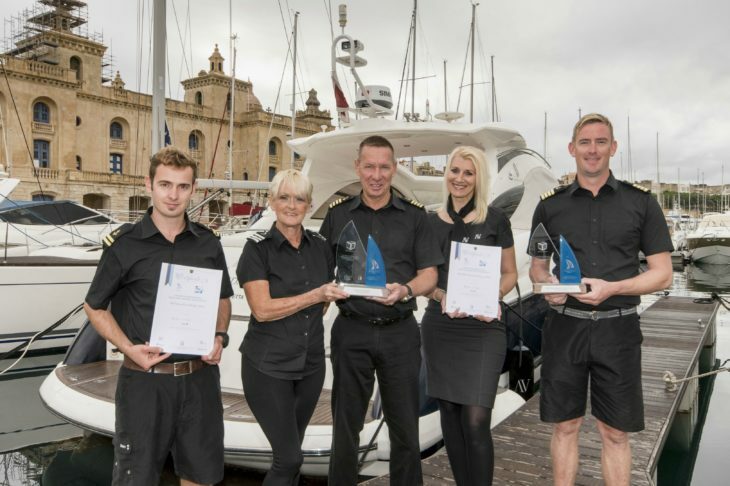 One of Azure Ultra's special features is its very own top-class yacht management team and crew. The team consists of four skippers, several deckhands and stewards and your charter specialist. They are specifically trained to meet Azure Ultra's exceptionally high standard of service. It is their careful attention to detail that ensures a seamless charter service that results in a superior private yacht charter experience for all on-board guests. Your first point of contact will be with our charter specialist, who will listen to your requirements and propose personalised options accordingly. Once aboard your charter yacht, an experienced boat captain and steward or stewardess will be your personal crew. Your crew members will be present on board at all times to attend to your needs and whims, offering stellar service and ensuring your full safety throughout your stay. When you set out to have a luxury yacht charter experience, luxury is what you expect. From the blissful Mediterranean seascape and iconic Sunseeker motoryacht to the demeanour of your crew and their immaculate yet friendly five-star service, everything is top class. Your captain will recommend places to visit, what to look out for and what to do as well as providing local information. Your steward/ess will serve a freshly prepared lunch spread consisting of Mediterranean delicacies on a table laid with a crisp linen tablecloth, premium plates and cutlery. You could expect roast chicken, a platter of cold meats and cheese, tuna, and a variety of dips, breads, salads, accompaniments and fruits; that's unless you've made special dietary requests or treated yourself to a special tailor-made menu for an on-board gastronomic experience. Would you like to include a massage on board or any other auxiliary services to enhance your luxury experience? Just make your request and the Azure Ultra team will do their utmost to satisfy your wishes. 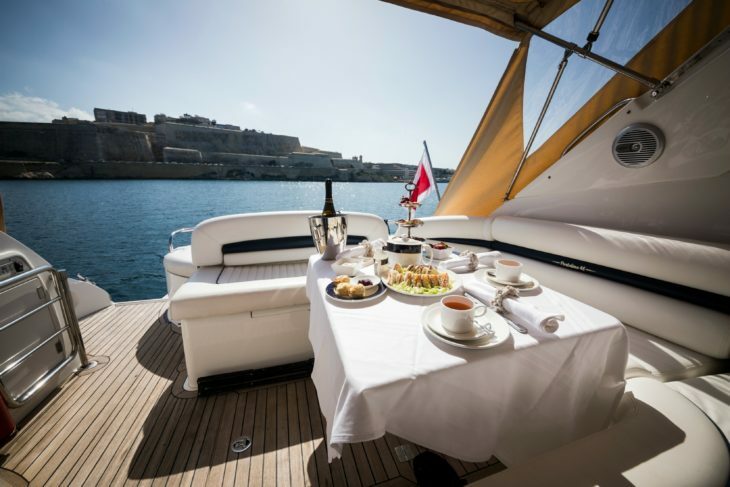 Yacht charters in Malta do not come more personalised, luxurious and exclusive than this. Your charter yacht will be one of the four stunning Sunseeker motor yachts that make up Azure Ultra's own fleet. Sunseeker is the Rolls Royce of power yachts and when you step aboard, you'll immediately understand why. From the beautiful form, layout and finish of the boat to its exceptional performance, Sunseeker is nothing less than floating luxury. The boat's on-board home comforts include luxurious sleeping accommodation, air conditioning throughout, hot showers and a fully equipped kitchen. Are you looking for a fabulous weekender motor yacht? Step aboard our Sunseeker Portofino 46, Miss Moneypenny. Are you looking for a spacious and stylish entertainer? Don't Ask, our Sunseeker Manhattan 56, is the one for you. Do you want to experience an impressive, cutting edge performer? 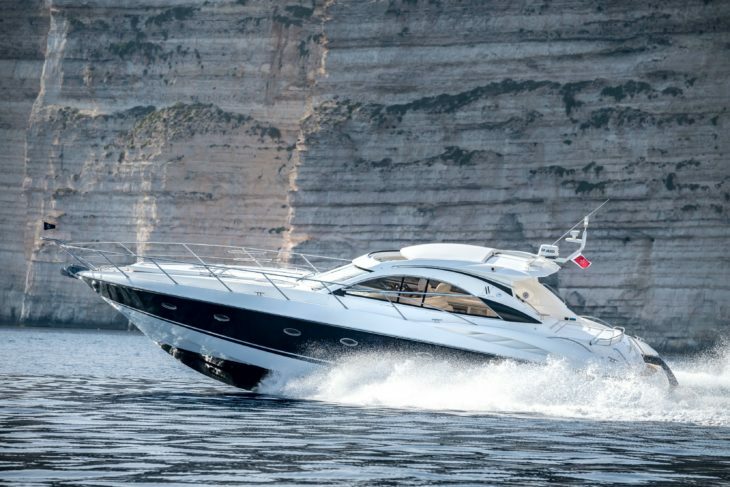 Take a ride on Mio Amore, our Sunseeker Manhattan 64. Do you want to combine a lush interior with supreme performance to make an impression? Welcome to the Sunseeker Camargue 50, Senda Dos. Whatever your intention and purpose, Azure Ultra has the perfect Sunseeker charter yacht to suit your needs. In case an amazing shoreline, sparkling seas and a Sunseeker yacht were not enough to keep you feeling like you're wallowing in indulgence, the luxury motor yacht's on-board facilities, plus some additional ones courtesy of Azure Ultra, will surely do it. Your on-board entertainment includes Wi-Fi and Bluetooth connection, satellite TV, LCD screens and DVD/MP3 player with surround sound system. To make the most of the fact that you are at sea, use the snorkelling equipment and see-through bottom kayaks. Relish also a trip to explore the caves and shoreline on the boat's inflatable tender with your captain. The azure, clear waters of the Mediterranean Sea surround the Maltese Islands, the apt home base of Azure Ultra. Known as one of the world's top diving spots, the Maltese islands offer some of the best water sports. In addition, the five islands of Malta, Gozo, Comino, Cominotto and Filfla have a stunning coastline full of interesting rock features and caves as well as sheltered coves, pretty bays and sandy beaches. The islands themselves bear testimony to 7,000 years of history, including relics from ancient seafarers such as the Phoenicians. From this spot in the heart of the Mediterranean Sea, home to the famous Blue Lagoon, Europe’s leading brand in luxury yacht experiences offers exciting possibilities for indulging in the ultimate Mediterranean holiday in Malta and the surrounding mid-Med region. Let time stand still as cruising on the water becomes the only thing that matters, right here, right now. Azure Ultra yacht charters offer more than just the option of chartering a yacht. Our revolutionary fractional yacht ownership programme makes fine living on deck an accessible way of life. Fractional Ownership simply means you part-own a yacht within an innovative boat sharing programme designed to render yacht ownership affordable and hassle-free. Now anybody can own a luxury motor yacht. For a fraction of the purchase price and a reasonable annual fee, you enjoy the boat and cover all expenses. These include berthing fees, insurance fees, maintenance expenses and operational expenses. In addition, you benefit from a full crew, including skipper and steward, on every trip. What's more, deckhands clean and polish the boats on your behalf. You simply enjoy the best of motor yachting without any of the worry or hard work. Better still, if you can't enjoy a boating holiday at any time, there are several land-based exchange options or you can charter your on-board entitlement so you never lose out! Allow our charter specialists to make all the necessary arrangements to complete your bespoke Mediterranean vacation. Experience VIP treatment aboard your luxury Sunseeker then continue to enjoy a pristine setting ashore. At your request, we can arrange exclusive five-star accommodation on the Maltese Islands along with your Azure Ultra private yacht charter. We have hand-picked some of the most exclusive properties and accommodation available. Taste local tradition in boutique accommodation set in a converted townhouse or historic palazzo. Experience Mediterranean luxury in a penthouse suite or detached villa with swimming pool. Experience the exotic at a beachfront property or five-star beach resort accommodation. Book your boating holiday in the Mediterranean with Azure Ultra yacht charters and get much more. Above all, you enjoy serenity and peace of mind knowing you are in the reputable and reliable hands of one of the top yacht charter companies in the Mediterranean region.